“You were my first interview ever and I was panic-stricken,” recalls Michael Boyd with humor. The first time I met him, he was sitting inside a chicken-coop turned-studio in downtown Denver. It was winter 1991 and I’d woven a checkered path through some spotty neighborhoods to find the tiny door that would transport me into Boyd’s world. I had been told that Boyd was a rising star, a sweet man, and an eclectic character. True on all counts. My first impression was that he was strangely like a child prodigy — even though Boyd was in his early 30s at the time, he seemed like someone whose talent was rough and undiscovered, like an uncut stone. Yet it wasn’t lack of skill I detected, but an innocence of spirit that, I have learned, is matched by the soul of a sage. Lapis, gem chrysocolla, amethyst, tourmaline, and emerald. The spoon is of jade with a handle of fine and sterling silver, 22K gold, bloodstone, and peridot. Since that day seven years ago, Boyd has continued to develop his craft. His work has evolved with such ingenuity, precision, and whimsy that I am amazed at my own amazement. “I should have expected this,” I muse. 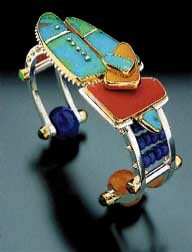 Well known for his contemporary roll-on cuff bracelets of colorful stones and mixed metals, Boyd captured me from the start with his architectural designs. He was the first jewelry artist whom I would commission to make a piece of jewelry. For a freelance writer, such things are a rare treat, but it was well worth the investment. I still wear my Boyd bracelet with its stacked, geometric shapes of such colorful materials as parrot wing, sugilite, and azurite. 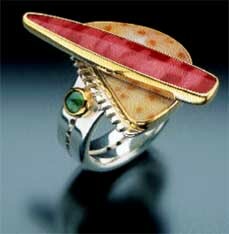 While Boyd remains on the cutting edge of contemporary jewelry design, he has branched out. For the first time, he is introducing to the public his hand-fabricated teapots and vessels made from stone and mixed metals. Gem chrysocolla, jaspers, and lapis. Once again, it’s winter. But this time, I speak to Boyd from a distance – from the East Coast to the Rocky Mountains. In the background, I hear the familiar sounds of hammering buzz through the phone lines from his studio in Salida, Colorado. Salida is the kind of town that used to be home to one horse, a few saloons, and a handful of mountain men. However, since the ’70s, this alpine haven has blossomed into an artist enclave home to dozens of painters, sculptors, jewelry designers, metalsmiths, and other craftspeople. Gaspeite, black jade, zebra dolomite, and citrine. From the collection of Geraldine Alexander, courtesy Obsidian Gallery. Boyd left the bustle of his hometown of Denver a few years back and traded it for Salida’s cleaner air and his favorite “14ers” (the Rockies’ famed 14,000-foot peaks). The town fosters an organic lifestyle that, in turn, fosters Boyd’s natural flair. A social creature as well as a creative one, Boyd might spend an average day working in his studio, taking a coffee break with local photographer extraordinaire Tim Brown, kayaking down the Arkansas for lunch, and then working with his studio-mate/assistants Rod Porco and Nicole Hansen in the afternoon. Boyd’s studio has evolved from a rustic open space into a full, street-front gallery where Boyd and gallery partner Geraldine Alexander feature contemporary innovative works of art, objects, and jewelry by Boyd as well as other regional artists. Whether it’s form versus function or function for function’s sake, Boyd has turned a teapot into a virtual ceremony – no water necessary. At first glance, his Long-Legged Teapot looks like it could take flight and orbit a small galaxy of tea cups and flying saucers in an outer space where “high tea” has more to do with science fiction than British tradition. A two-part set, the teapot was designed to sit snugly on its long-legged base. At the tip of the sinewy silver handle is a slice of ammonite embellished with gem chrysocolla and yellow jasper. 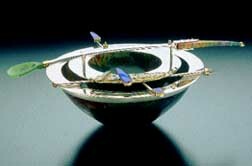 The lid is constructed of serpentine and black jade with a ruby cabochon as an accent. 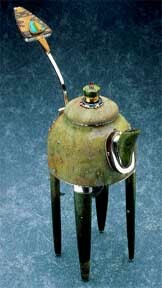 The body of the teapot is constructed soapstone, but further enhanced with green and poppy jasper and serpentine. Various cabochons of turquoise, red coral, and jasper also embellish the pot. A bit of an optical illusion is provided by a large, green-hued ruby-in-zoisite tucked underneath the pot. At first glance, the stone appears to be attached to the silver stand, which rests atop long green jasper legs, but when the teapot is lifted, the zoisite remains on its bottom. Boyd’s starting point was an old Chinese lidded teapot, which he then transformed beyond recognition. “The body of this teapot is made of soapstone. Picture a stone teapot that has dragons and designs on its surface, a lid and everything. I cut all of the stuff off of the outside, and reground it. I cut the handle and spout off and ground the surface down to a shell and its base. Onto this hollow form I began attaching all the other elements,” Boyd explains. Once Boyd creates a new surface for a teapot on which to apply stone, he starts building his creation like an assemblage. Ultimately the original, second-hand teapot becomes merely the core interior for a next-generation form of higher beauty. black jade, jasper, ammonite, gem chrysocolla, turquoise, coral, and ruby-in-zoisite added. Coral, black jade, yellow jasper, and granite. Loose ruby, emerald, and sapphire beads inside the pot’s lid give the piece its name. In Rattle Top Teapot Boyd uses an exaggeratedly long handle tipped with Dalmatian jasper. This teapot also originated as a soapstone hollow form. 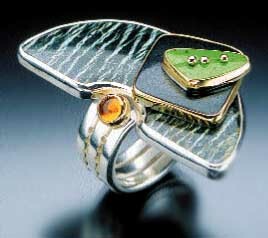 Accents of bezel-set onyx are applied to the belly of the pot, and fine silver and 18- and 22-karat gold rings are used as design elements. For the teapot’s distinctive “rattle,” Boyd used some materials he had lying around – beads of ruby, sapphire, and emerald. “I kept a lot of odd-shaped gemstone beads. The top is filled with these beads; they are inside and invisible to the viewer. Dumortierite-in-quartz, serpentine, chrome tourmaline, amethyst, jasper, granite, and spectrolite by hinges. When the body is lifted, the utensils swing aimlessly. 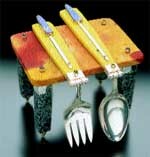 Boyd finds further food for thought with dining utensils. With one vessel entitled Feeding Ego, he attached stone handles and then a silver fork and spoon so that the utensils meet as if hinged. When the handle of Afghani serpentine, dumortierite, emeralds, sterling silver, and 22-karat gold is lifted, the fork and spoon swing aimlessly. 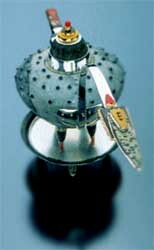 Among Boyd’s current creations and objects of desire made from stone and mixed metals are tea balls, forks and spoons, candlesticks, letter openers, and even a compass which actually works. Boyd will unveil his teapots and other objects on April 3 at Mobilia Gallery in Cambridge, Massachusetts, and on June 26 at his own gallery, Cultureclash, in Salida.